The marker on the map above is the location of the current office building that would be demolished for this project. 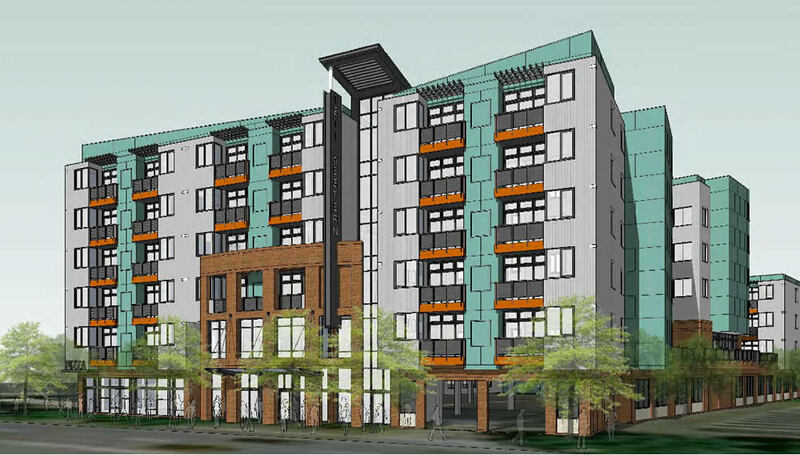 A rendering of the eastern side of the project. Attorney Donald Zee, who's representing the project, said the developers are willing to build out a new water line along the site and contribute funding for sewer upgrades in the area. Engineer Wendy Holzberger of VHB said these sorts of buildings tend to be a "low generator" vehicle trips because the residents are students, and the trips that are generated are usually during regular rush hour. 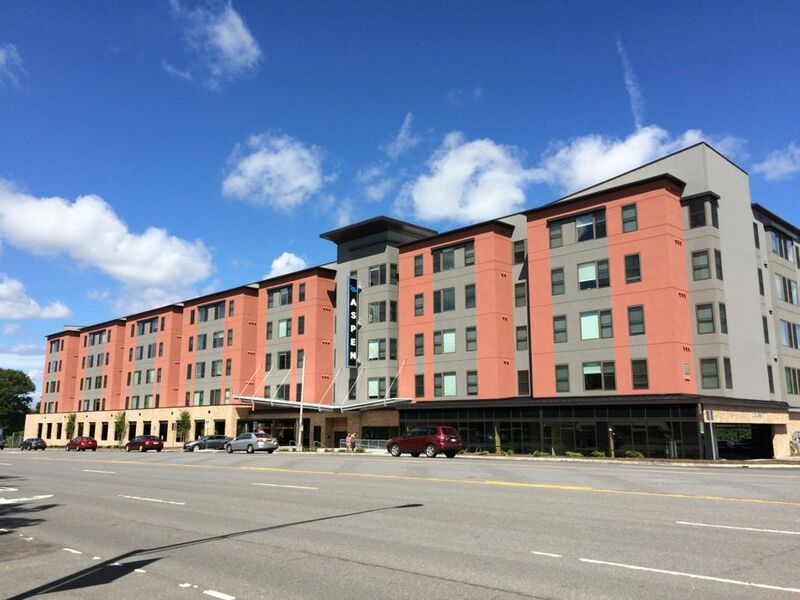 And GSX developer/architect John Grant described the Aspen at 1475 Washington Ave as a successful project, said they had made some adjustments to the fire monitoring system to cut down on false alarms (apparently the Aspen has generated many false alarms), talked about the safety and security measures at the proposed building. The Aspen on Washington Ave. The board asked a few questions about parking and design. But it was a question/comment from board member Alison Bates that appeared to be most important: She asked why the project was being filed under the classification of a "group living facility" -- and was skeptical that services offered in the building would qualify it for such a tag. And Al DeSalvo, the board chair, asked why the project wasn't classified as a dormitory. 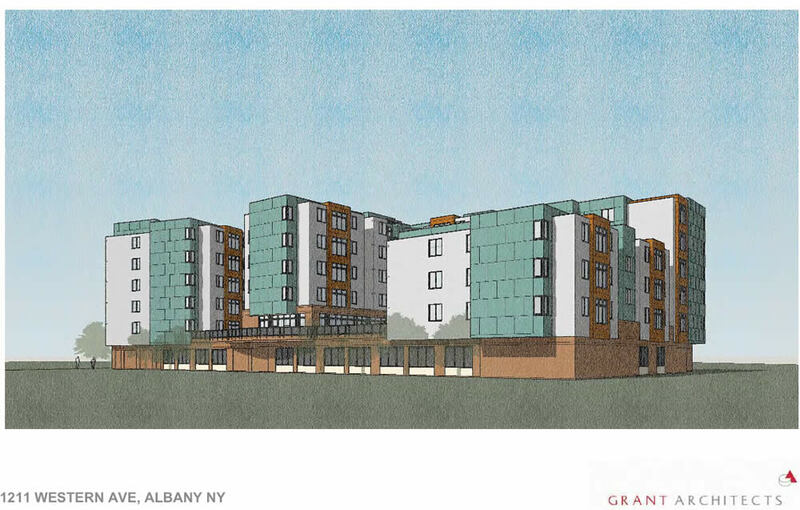 Donald Zee, the attorney, replied that the building could house people other than students, and pointed to the Aspen as example, where he said some UAlbany coaches have lived. He said the backers would provide the full rationale for the category in writing. Then it was time for public comments -- and there were many. Tom Hoey -- who both works for UAlbany and is the Common Council member-elect for the neighborhood -- also criticized the project. He expressed concerns about the longterm viability of the project, was doubtful the building would have requisite staffing, and he argued it was another step in the creeping commercialization of higher education. One other thread to the public comments is that this neighborhood is adjacent to the Harriman State Office Campus. And multiple commenters mentioned their displeasure with noise and dust from the construction of UAlbany's new ETEC building on the western end of the state campus. As longtime resident Pat Byron said, "Tudor Road has suffered enough with all this construction going on." This project will be back before the board again, and it's sure to continue generating comments. So stay tuned. The plan to to convert the upper 10 stories of 90 State Street in downtown Albany into market-rate 120 apartments was back before the board. The developer backing the project is the same one did the Harmony Mills loft conversion in Cohoes and the Albany International building loft conversion in Menands/Albany. Nadine Shadlock was again representing the project, and she reiterated the outline of the plan for the board. The project will done in stages, with an expected completion date no later than 2021. This appearance was short and to the point so the board could vote on approval of the development plan. But it did end up catching briefly on one snag. In raising the issue of approval, chair Al DeSalvo mentioned a deed restriction for the city's upcoming inclusionary zoning provision. Shadlock pushed back on the inclusion of the restriction, arguing that the addition of one could possibly pose problems if the building owner chose to switch the space back to office use in the future. And she said she did not see in the city's zoning code any mention of such a requirement. The proceeding slowed for a moment as there was a review of the text of the code -- and agreement there was no explicit requirement. The motion for approval moved forward and was unanimously approved. Albany's new inclusionary zoning requirement -- which calls for 5 percent of units in projects with 50 or more units to be set aside at rent levels prescribed in the zoning -- starts December 1. And when it was included in the huge Rezone Albany overhaul of the city code, officials were very open about the fact they would have work out the details about how it will work. So as the start date approaches, the specifics of the IZ provision are something to keep an eye on. The social services org Rehabilitation Support Services is proposing to demolish the old School 22 building, along with an adjacent home, in order to build three new homes for people with substance abuse and addiction issues. Each one family-style homes would include space for eight people. Thursday was the first time up before the board for this version of the project. But there's been a multi-year fight over the property. A 2014 bid to replace the old school building with a single structure to house 24 people failed to get a necessary variance from the city's Board of Zoning Appeals -after the BZA concluded there was a saturation of such facilities in the West Hill neighborhood. That prompted a legal fight that the city ultimately won in 2016. And now RSS is making another attempt. Representing the project before the board, attorney Charles Dumas said this new version of the project fits with the city's new zoning code. He said RSS has funding lined up for the project from the state Office of Alcoholism and Substance Abuse Services (OASAS) and the funding is tied to the property. The project faced some skeptical questions from chair Al DeSalvo. Representatives for RSS said the old School 22 building was in bad shape -- the roof and floors have collapsed -- and demolition was the prudent course. But DeSalvo wondered if RSS, which has owned the property since 2012, might be guilty of demolition of neglect. The RSS team responded that the building was already failing when they acquired the property. There was a little more discussion from board members about whether the properties could theoretically be repurposed in the future as regular single family housing. RSS reps said that would be possible. And there was some talk about possible placing the front doors of the buildings so they face the street so as to make them more like typical housing. Andrew and Joan Jenkins are proposing to rehab the vacant 5,500 square foot building at 80 North Allen Street (map) -- on the corner with Lancaster Street -- into six apartments, a mix of 2BR and 3BR. This was the project's first time up before the board. Engineer Rich Nolan told the board the building needs some significant repairs, but it's structurally sound. And he said the Jenkins are willing to be flexible to get the project moving. Chair Al DeSalvo was skeptical that the budget mentioned in the application -- $350k -- would be enough for the project. And the was borne out when Andrew Jenkins came up to address the board and said a recent estimate from a contractor put the figure at closer to $700k. DeSalvo said it would be important for the board to get a better sense of the numbers to understand the feasibility of the project. Jenkins said they're working on getting a commitment letter from a lender. This property has apparently had a difficult history. (Nolan mentioned that its most recent use was as single room occupancy apartments for 26 people.) And that was backed up by the public comments -- four neighbors spoke, expressing their dismay about the state of the property and their skepticism about the feasibility and management of the proposed project. As Esther Thornton, of the New Albany Neighborhood Association, told the board, it's not great that the property is currently deteriorating -- but it was worse when it had been occupied in the past. The proposed redevelopment of the Playdium site at 363 Ontario Street was back up before the board, but for a very specific reason: The board was considering whether to offer a recommendation to the BZA about the height variance the project is seeking. Common Council member Judy Doesschate was again one of the three public comments expressing skepticism of the project's size. 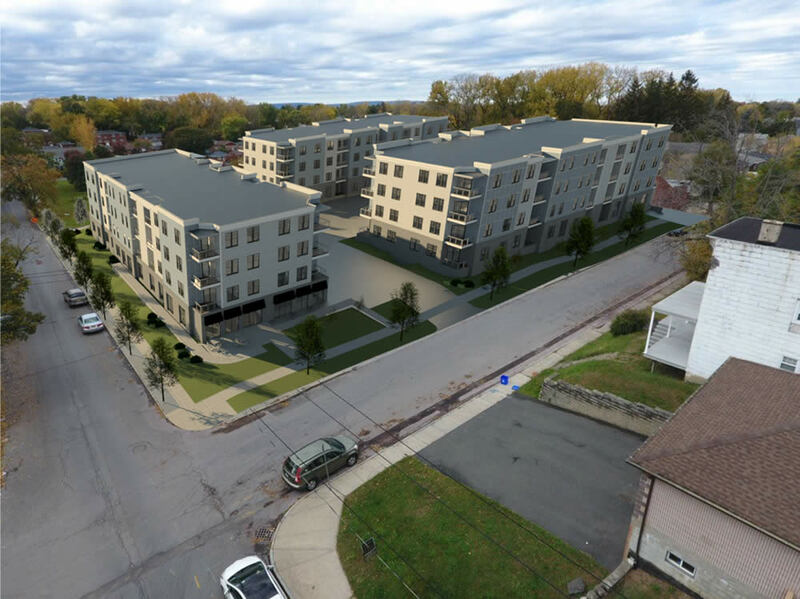 She said her concerns about the four-story height were crystallized this week while attending the community meeting for the New Scotland Village project across from St. Peter's and hearing people there push back against a project that was three stories. The board vote on the recommendation was a little more drawn than out usual as the members were clearly considering their options. DeSalvo in particular seemed conflicted. But all the members ended voting in favor of recommending the BZA consider the variance, with a note that the board is still reviewing the design. The project will be back up before the BZA November 22. There was little discussion and the board voted unanimously to recommend the BZA consider the variances. The project will be fore the BZA November 22. The New Scotland Village retail/residential project proposed for the site across from St. Peters was originally scheduled for this meeting, but was pulled out of it concern there wasn't enough time between the community meeting this week and the planning board meeting. It should be up before the board in December. Would that all these people had paid attention to the Re-Zone Albany initiative that codified much of what people are objecting to. Certainly not unique to Albany, but I just find it outrageous that a struggling post-industrial city garners so much opposition to investment and the very type of greater density development that will make the city more walkable. These investments employ people, contribute to the city's tax revenue, and while they may not have the same architectural value as the city's prewar construction, gives the city a shot at being a cohesive and pedestrian friendly environment. If people want low density, we have more than enough suburban communities to satisfy that demand. But one cannot claim that there isn't a desire to live in urban settings when it is public policy that outlaws the ability to produce non-automobile oriented communities to begin with. On the western Ave project, why not use the land in the Harriman campus. I thought the state offer it up to the city. If this is approved after 4pm western Ave will be a parking lot. I'm glad to see people involved in community decisions. But at the same time, we can't just keep saying we want development "somewhere else" or "not in my backyard!". Having mini-suburbs in the city of Albany was feasible at one point in time, and now development is catching up. Noise and dust is just something you'll have to deal with. The building next to mine was gutted and renovated this summer - I dealt with it because that's the price of improvement. Why would anyone want this built in the Harriman campus (and why would anyone want to live there)? So it can be cut off from the rest of the city by the dual ring roads? In the last round of RFPs, the state made it clear that they didn't want residential development in the campus. The idea is to make Albany more walkable, not less. Sure, upper Western Ave may not be the most pedestrian-friendly part of the city, but at least there are sidewalks and many businesses one can walk to within a few blocks. If students actually needed these dorms so bad, Suny would be all over it. So why does a private firm feel the need to do this? And what kind of ridiculous tax beak will they be asking for? 2) IF SUNYA did build and manage the dorms the property would be tax exempt and not subject to local land use controls because the State is exempt. No property tax revenue, no local input. Be careful what you wish for.